The number 5 team in the nation, North Central College, were upset by UW-Stevens Point on Saturday. Homecoming for UW-Stevens Point turned out to be a reason to celebrate on Saturday as the Pointers upset the number 5 team in Division 3 Football, North Central College 34-27. Kyle Larson threw for 302 yards to lead the Pointers to the surprising victory. The game started well for North Central. They elected to start on offense first and made the Pointers pay with Dylan Warden's 50 yard touchdown pass to Peter Sorenson. UW-Stevens Point responded with a solid drive of their own and made it a 7-3 deficit after Jesse Vervelde's 28 yard field goal. The Pointers continued the momentum by blocking North Central's 33 yard field goal attempt by Dominic Zavaglia. Steven's Point did not make the most of the blocked field goal, but they did get another field goal to make it 7-6. The Pointers caused more havoc when Jake Luedtke intercepted Warden's pass. However, the Pointers were unable to get more than a field goal for the third time in the game. Vervelde's field goal from 26 yards gave the Pointers a 9-7 lead early in the second quarter. After both teams traded punts, North Central found the end zone again. Ryan Kent took his first down handoff and rumbled 48 yards for the touchdown to put North Central on top 14-9. The Pointers had a response again, and this time it was in the form of a touchdown. Kyle Larson hit Matt Sosinsky from 11 yards out to give them the 16-14 lead. North Central had one final drive in them to end the first half. The Cardinals drove 65 yards in 11 plays and burned the last 2:19 off the clock. Zavaglia's 32 yard field goal gave them the lead 17-16 at the break. After forcing a punt, the Cardinals appeared to be gaining a grip on the game after their first drive of the third quarter. Warden connected with Zach Pattat for a 64 touchdown pass to make it 24-16. However, the Pointers would not go away. A methodical drive by Stevens Point would see the game tied at 24 apiece. The Pointers drove 69 yards in 12 plays and took 6:39 off the clock on their way to Larson's 8 yard touchdown pass to Logan Taylor. Larson found Taylor on the two point conversion to tie the game at 24. The ensuing drive by the Cardinals led to an interception of Warden's pass by Deion Jones. Jones took the ball all the way back to North Central's 19 yard line. Four plays later, Jake Menzel ran in from 5 yards out to give UW-Stevens Point a 31-24 lead. Feeling the momentum on their side, the Pointers attempted an onside kick and recovered, but were called for illegal touching. That penalty gave the Cardinals the ball at the 44 yard line, but nothing came of it as the Cardinals could not convert the fourth and 1 from the 35 yard line. The ensuing drive ended with Vervelde's fourth field goal of the day, this one from 33 yards to make it 34-24 early in the fourth quarter. The Pointers had a wonderful opportunity to end any hope of a North Central comeback. Zach Vallafskey intercepted Warden's pass and brought it back to the 33 yard line. The Pointers were on the door step of the Cardinals' end zone, but Jake Menzel's fumble at the one yard line was picked up by Trey Hartema and brought back to the 43 yard line. The Cardinals were able to make it a one score game with a 29 yard field goal, but that was as close as they would get. The Cardinals had a chance to score when they were at the Pointers' 14 yard line. However, two sacks and a fumble left them with an impossible fourth and 22 to convert, which they did not. The Cardinals had a chance in the final 90 seconds. Tyler Dicken was stopped on his fourth and one carry at his own 47, which gave the Pointers the ball to run out the clock. For North Central, they played two different quarterbacks. Dylan Warden went 6 of 16 for 175 yards and two touchdowns. However, he threw three interceptions, which led to 10 points. Tyler Dicken spelled Warden in the second half, but he was not that effective. He went 3 of 10 for 56 yards and an interception. Ryan Kent had another solid game with 107 yards and 1 touchdown on 12 carries. Warden carried the ball 9 times for 57 yards. Peter Sorenson led the Cardinals in receiving with 4 catches for 114 yards and a touchdown. The Pointers were most effective through the air. Kyle Larson went 25 of 38 for 302 yards and two touchdowns. Jake Menzel led the team in rushing with 38 yards and a touchdown on 10 carries. The Pointers ran for only 46 yards on 37 carries. Logan Taylor caught 10 passes for 108 yards and a touchdown. Matt Sosinsky had a big game as well with 9 catches for 145 yards and a touchdown. North Central College (2-1) opens their CCIW slate next week with a home game versus Millikin. 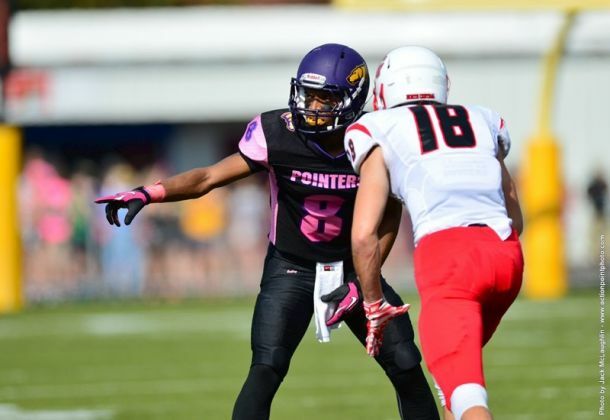 UW-Stevens Point (3-0) goes into their conference schedule full of confidence and momentum. The Pointers take on UW-River Falls (1-2) next week on the road.